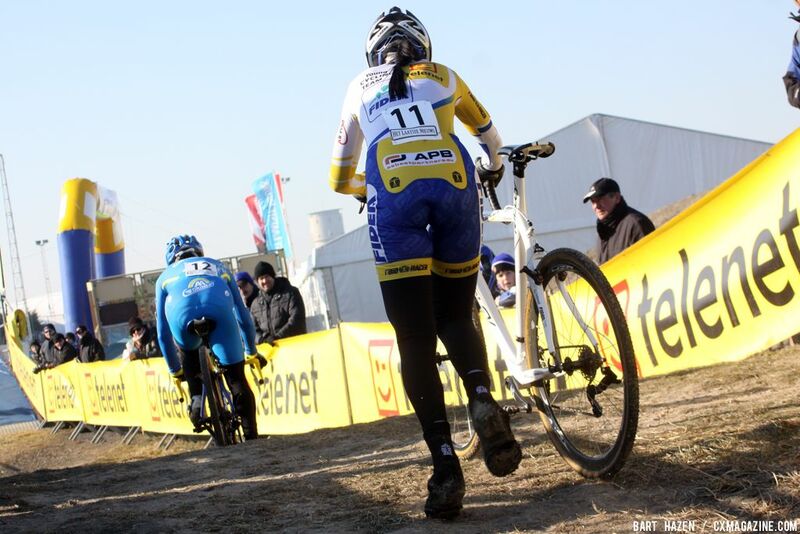 MIDDELKERKE, BELGIUM—On a sunny but blisteringly cold day, the European cyclocross peloton lined up for the final round of the 2011-2012 Superprestige series. With Sven Nys (Landbouwkrediet), Kevin Pauwels (Sunweb-Revor) and Zdenek Stybar (Quickstep) all within striking distance of winning the overall points competition the racing was going to be gritty. As with the past few weeks, the race started out with a large group sticking together at the front. 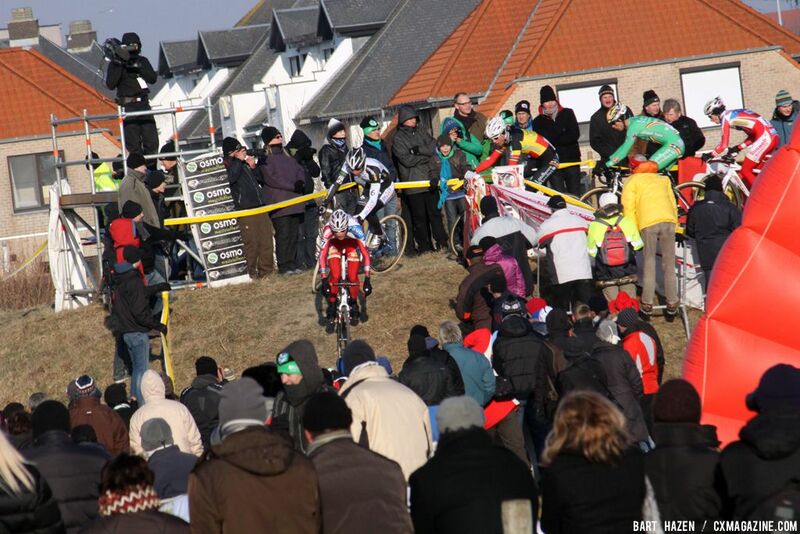 Klaas Vantornout (Sunweb-Revor) led the field onto the sandy frozen field and traded leads with Sven Vanthourenhout (Landbouwkrediet), as Pauwels’ and Nys’ respective teammates looked to set their riders up perfectly for an epic showdown. As soon as the field came to the barriers, Rob Peeters (Telenet-Fidea) took advantage, hopping the barriers and hitting the front of the race by the end of the sand section. 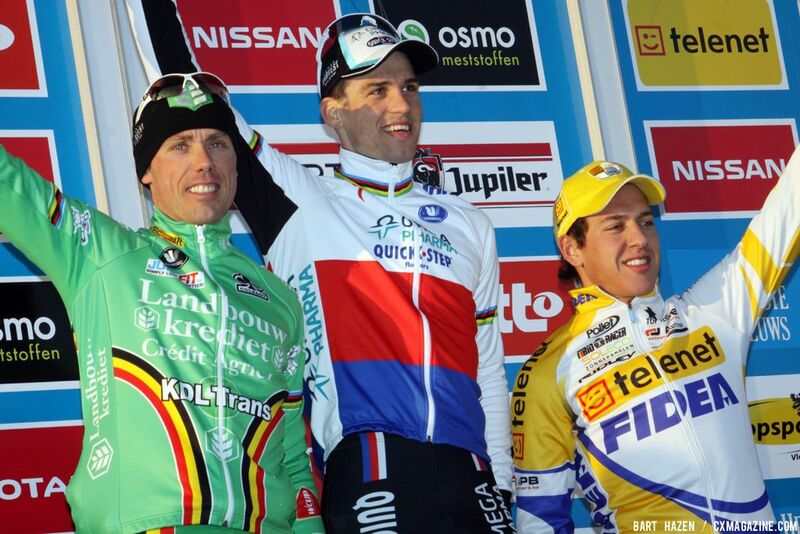 The only other riders to hop the barriers were Nys, Stybar and Peeters’ teammate Tom Meeusen (Telenet-Fidea). 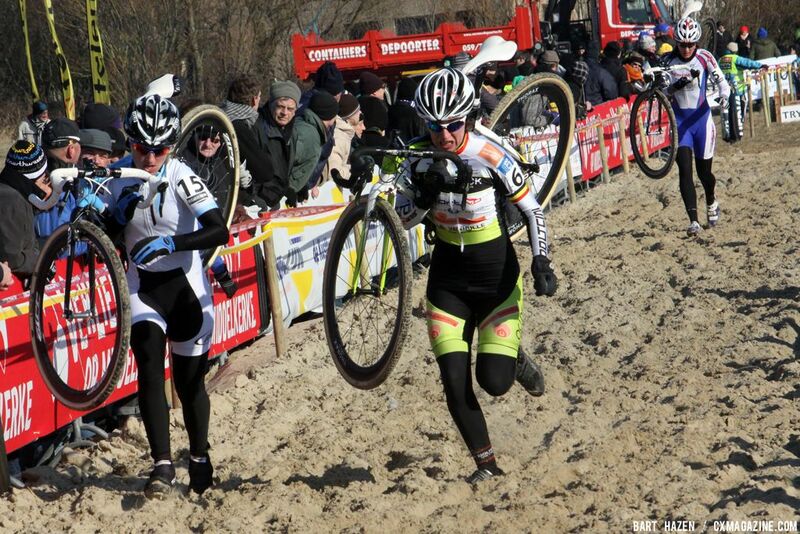 It was clearly an advantage as each of these riders gained one or two seconds through the sand every lap. Early on it was clear that it was not Niels Albert’s (BKCP-Powerplus) day, sitting farther back in the field than any of the heavy favorites and crashing in the sand pit on the first time through. Though the first two laps aped fast group road racing, the field strung out single-file, it didn’t take long for Nys to assert his dominance on the tricky course: When he used his barrier-hopping to make a small separation, the only rider able to follow was Radomir Simunek Jr. (BKCP-Powerplus) with Klaas Vantornout following a few more seconds back. 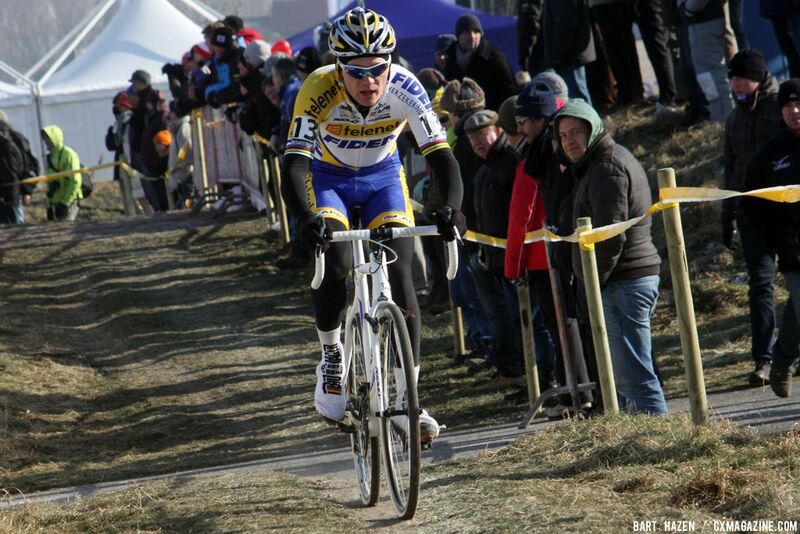 Nys, Simunek and Vantornout continued to stay away until a surging Kevin Pauwels bridged to the group. But Pauwels’ minutes on the front of the race were numbered as Stybar was on a mission to get out of the chase group and move to the front. 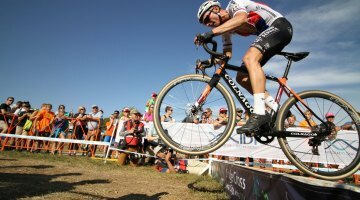 Using the barrier, sand and power sections to his advantage, Stybar made the small group of Pauwels and Vantornout, as Nys had gapped them in the sand again. Shortly thereafter a larger front group came together including all of the heavy favorites: Nys, Stybar, Pauwels, Albert, Vantornout, Meeusen, Vanthourenhout. It didn’t take long for that to change, however. 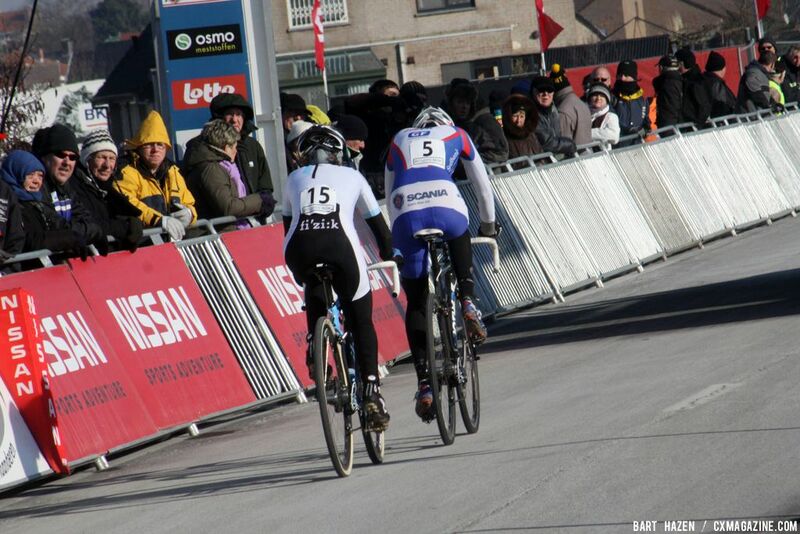 As soon as Stybar took control on lap five, only one man was able to stay with him: Nys. It was clear that the race from then on would be for third. Nys and Stybar were clearly the dominant riders of the day both technically and physically, with neither man being able to shake the other. As the race dragged on for the next three laps, Stybar was clearly doing more work, even asking Nys for help on occasion, but Nys’ early efforts seemed to have taken the snap out of his legs. They came into the finishing straight together and though Stybar led the sprint out, Nys didn’t have enough to get around and Stybar rolled through for the win. Nys may have lost the battle, however, in winning the war, by taking the Superprestige overall title for an unbelievable 10th time. Behind them, everyone else was battling for position. Pauwels was trying to shake Meeusen to grab the last podium place, but Meeusen’s deadly sprint and superior handling skills put Pauwels on the back foot for the day and relegated the hero of the season to fourth on the day. Jonathan Page put together a respectable ride for 16th today after being caught out early and sitting in nearly last place towards the end of the first lap. 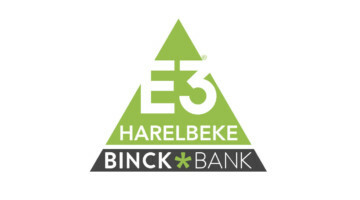 In the women’s race, Daphny van den Brand (AA Drink-Leontien.nl) beat a reduced field that still included dangerous riders such as Pavla Havlikova (Telenet-Fidea), Nikki Harris (Telenet-Fidea), Helen Wyman (Kona) and Amy Dombroski (Crank Brothers). Van den Brand, Harris, and Havlikova rode away with the podium early, battled for the whole race, and then it was the retiring Dutchwoman pulling away late to secure another win in her storied career. 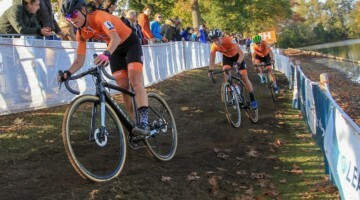 The Superprestige doesn’t have an overall ranking for women, which may partially explain the smaller field.